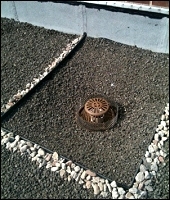 Installing source controls on existing rooftops is an important strategy that DEP is pursuing to reduce stormwater runoff from entering the sewers because rooftops comprise almost a third of NewYork City's total impervious surface area. On PS 118 in Queens, two alternatives to conventional rooftop surfaces are being tested by DEP in partnership with the Department of Education: green roofs and blue roofs. Data from the study at PS 118 will be collected to compare the stormwater management performance of green, blue, and control roofs during a three-year monitoring period. Because all three surfaces will be on the same building, this pilot will compare costs and benefits under similar environmental conditions. Green roofs consist of a vegetative layer that grows in a specially-designed soil, which sits on topof a drainage layer. 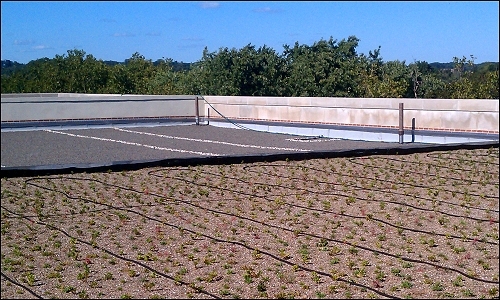 Green roofs are more costly than conventional roofs but they are capable of absorbing and retaining large amounts of stormwater. In addition, green roofs provide sustainability benefits such as absorbing air and noise pollution, rooftop cooling by reducing UV radiationabsorption, creating living environments for birds, and increasing the quality-of-life for residents. The City provides a Green Roof Tax Abatement from City property taxes of $4.50 per square foot ofgreen roof, up to $100,000. The PS 118 pilot project will compare costs and benefits of these stormwater management approaches under similar environmental conditions.